As a person raised in Queens, I didn’t know much of Brooklyn’s history, so in the beginning of the semester when I found out my English class would visit the Brooklyn Historic Society, I was excited. I have an interest in history and learning how things were different and compare it to my own life. Thinking about how life was in the 1800’s or the 60’s is interesting because it’s different from our lives now. At my class’s first visit to the Brooklyn Historic Society, I didn’t know what to except to get out of it. 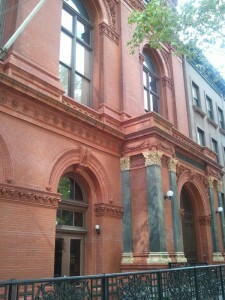 When I reach the Brooklyn Historic Society, the exterior of the building caught my attention right away. It was different from the all the building in the surrounding area. You can tell the building is a landmark, with its brick walls and arches over every door and high windows. The first time I walked into the Brooklyn Historic Society, the interior does show the history of the building. It has very high ceilings and a large staircase. You don’t see that often, in modern buildings. The library was even more beautiful. All the wood framing everywhere, large bookcases and columns that looks as though they held up the ceilings. Two levels filled with books and boxes holding documents. It just amazed me that majority of Brooklyn’s history was around me. But that wasn’t the most interesting part of my visit. I was able to read a letter from a women named Lucile (Lucy) Kolkin, who had wrote letters to her husband, while he was away during World War II. Lucy worked at the Brooklyn Navy yard and would write letters to her husband everyday about her day, what she was doing and what was happening around her. I compared Lucy’s letters to how we email and text message and use social networks to talk to people we haven’t seen in awhile and to see how there doing. Reading her letters also made me feel like I was invading into someone private life, theses were letter between a man and a woman. What came to mind was, how would people in the future look at our lives, our period of time differently. Before going to the BHS, my class had read an essay, “Reading Lucy”, published in Brooklyn is Mines, and written by Jennifer Egan. 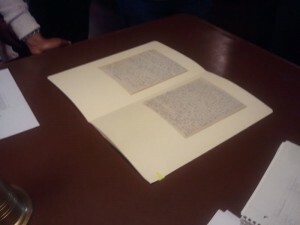 Jennifer Egan had visited the BHS and had read a collection of Lucy’s letters. Egan compares her life to Lucy’s life and had many similarities. She refers to Lucy as a friend, that they even have the same “to-do” lists, that Lucy walked the same streets Egan walks and they’re both interested in the Navy yard. Egan describes the relationship we gain with Lucy through the letters she had written to her husband, about 60 years prior. It just shows that no matter what time period or era you may live in there are similarities. On my second visit to the Brooklyn Historic Society, I had an idea for what to expect when I arrive at the BHS. I had a feeling we were going to work with more old documents, but it was different from the first. We started off by looking at the exterior of the building, which I was so interested in at the first visit. We discussed when we assume the building was built and also how there were faces of great males in history surrounding the building, such that of Christopher Columbus and William Shakespeare. After entering the BHS, the librarians gave us information about the Brooklyn Theater Fire in 1876. Many had attended the Brooklyn Theater that night to watch a play and many passed away due to the fire that night. On this visit, the group I was with looked at atlas. We choose to look at an atlas of Downtown Brooklyn in 1874 and an atlas of Downtown Brooklyn in 1977; to compare the area before and after the fire. The Brooklyn Theater was located on Washington Street, between Johnson Street and Myrtle Avenue, and I notice in the first atlas of Downtown in 1874, that on Washington street there was a railroad that ran up and down that street. A question that came to mind was, “If there were a fire department or any type of first responders how were they able to get to the fire, if there was a railroad on that street. I also thought how would life be if we didn’t have our first responders. How many other dangerous fires would we have? The atlas also showed how most of the streets that were during that period of time, still around now. After class, while walking thoughts of how life would have been walking during 1877. Of course, things change during time but it would be interesting to know how was it different. Changes occur a lot over several period of time. Styles of cloths, types of music and even our style of talking. So of course, the way maps and atlas were made would change over time. On our fourth visit, we were able to see a few of maps from history. But the first that we looked at was a subway map from this year. 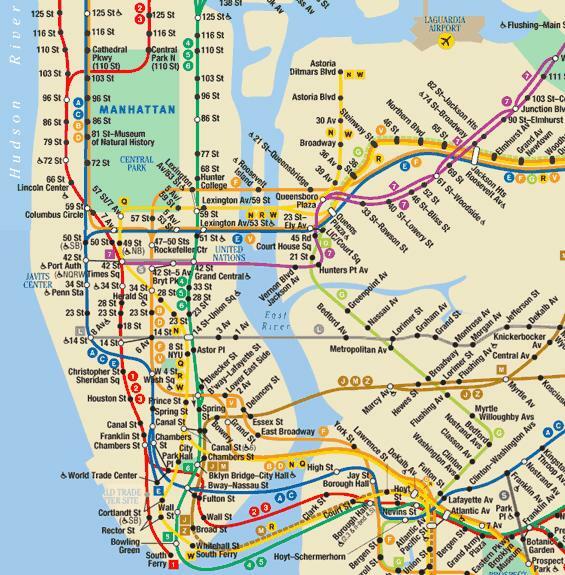 I was accustomed to see that map because I take the subway everyday. We then looked at a few very old maps. There were some with very little details and there were some with pictures on them; showing what types of animals and items you may have encountered in that area. 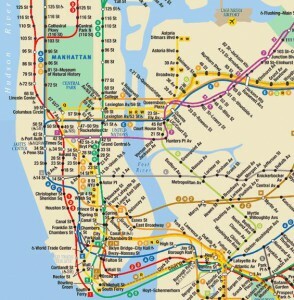 The last map we looked at was a subway map from the 1970′s, different from what I was used to seeing now. On the 1970’s subway map there are fewer train lines and most of the train lines that were running during that time was different from the ones we currently have. That in it shows how life changes but not completely. Because the maps may look different; fewer words, more details or may just show the area without much detail, but we still use maps to get direction. Now many may not use a map on paper but they may use GPS or MapQuest and it’s the same as using a map. Some people have said, “History repeats itself,” and in a way I do believe that is true. I believe there are several general things that never do change but the little things that change due to time. Like the passion we have for someone and express it into a letter or like the streets we walk on everyday to school and to walk or even like how we try to find out our sense of direction. The details may be different but the general idea is won’t change. This entry was posted in Student Post and tagged finalproject, safabhs. Bookmark the permalink. Thanks for this, Eliza. Please give your post an original title and please add a Works Cited list.